On Saturday, May 26th our annual First Confession was attended by 8 of our children with their respective families. The next day they came up for Holy Communion and then received gift icons from Fr. Walter before standing for the group photo. 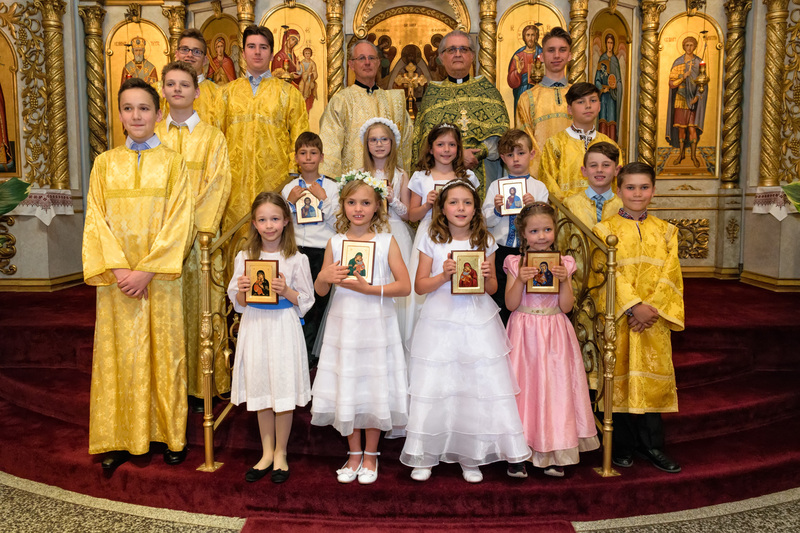 I feel that we have been blessed, here at St. Demetrius, in that we have so many children, of all ages, growing up in the church. 2nd row (l-r): Maxim Tolomiczenko, Larysa Balaura, Sarah Serediak, Alexander Mavros. Also, in the photo are Altar Servers, on the left side: Mykhailo Khakhula, Alexander Czyrnianski, Petro Dowhal, Lukian Zmiyiwsky; on the right side: Luke Tolomiczenko, Nicholas Mavros, Sergei Tolomiczenko, Basil Zmiyiwsky. In the back row: Rev. Deacon Borys Melnyk & Fr. Walter.